Join us on Independence Day for our annual evening Fireworks Viewing Sail! On this charter, we venture out just as the sun is setting and cruise the beaches to see what fireworks get set off. Although Santa Cruz does not sponsor an official show, we’re ready to spot whatever displays there are. Fireworks are not guaranteed, but Santa Cruz has yet to disappoint! 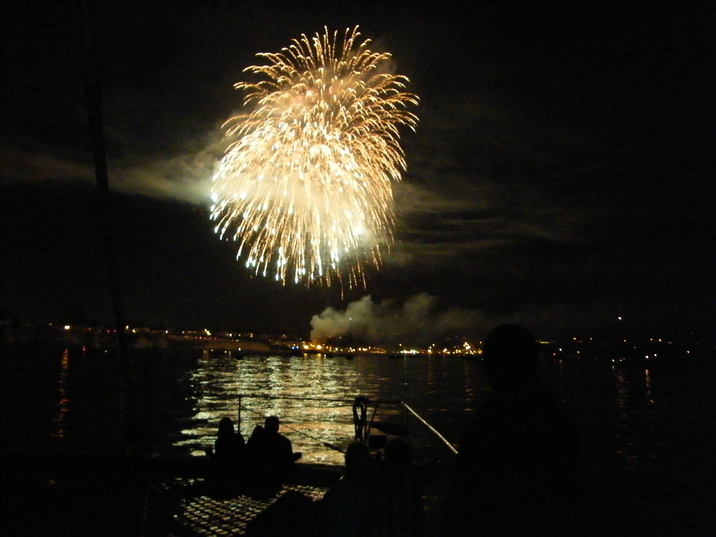 During the sail you can enjoy the scenic view of the night sky and the fireworks from the best seat on the Monterey Bay. All passengers receive complimentary cookies from Pacific Cookie Company, and can bring additional food and non-alcoholic beverages aboard. The galley bar will also be open all night, where you can purchase beer, wine, sodas, juices, hot cocoa, coffee or tea. Have questions? Check out our FAQs or get in touch with us. Prices subject to change without notice. The Santa Cruz Harbor Fee, admission tax, sales tax, and online convenience fees will be added to all applicable purchases. Just TIDE-ing up our schedule for the 2019 season! To be more PACIFIC, public sailing dates will be up on our website in mid-March! Stay TUNA’d!